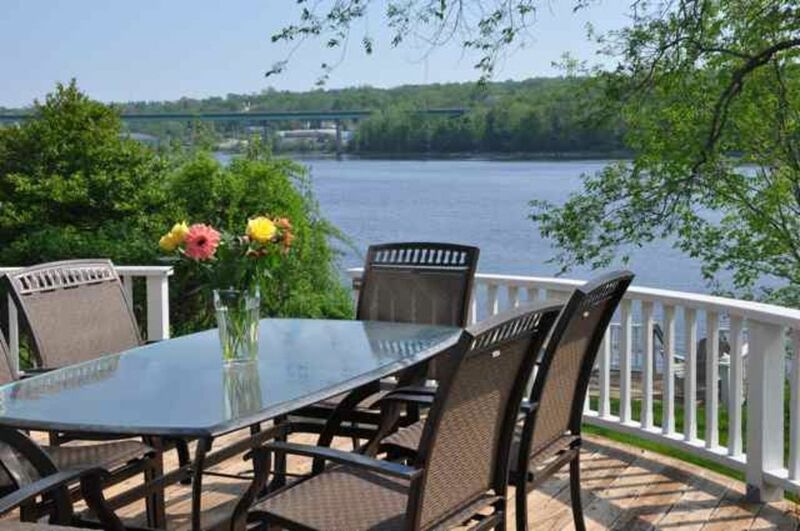 Spettacolare Waterfront Home sulla costa del Maine! 4 camere da letto, 3 bagni a casa su Belfast Harbor. Godetevi il caffè del mattino su due belle verande o un patio in pietra al bordo dell'acqua in questo quattro camere da letto, tre bagni casa. Camera matrimoniale con scala privata e bagno è un meraviglioso rifugio per le famiglie estese. Sun camera, soggiorno e aperto / sala da pranzo / soggiorno cucina dà spazio a tutti di diffondere. Passi privato ad una spiaggia di marea. Cinque minuti di auto o quindici minuti in bicicletta per il centro storico di Belfast. Grande punto di vista per il bird watching e di Belfast Bridge. Perfetto per il kayak, il nuoto e la pesca. Although we were only here 3 nights, we enjoyed the opportunity to stay here. Our family consisted of 6 adults rented here for 3 nights, and we absolutely loved the properly. Being able to sit back and relax on the porch looking at the calm water was priceless. The house is well equipped and beautifully decorated. We truely felt like our home away from home. We chose to stay in Belfast because it's in the middle of Maine coast. We could easily make a day trip to Bar Harbor going North, and to Portland and Ogunquit going South. I strongly recommended this properly for any group that wants to explore Maine coast. My mother, sisters and I thoroughly enjoyed our long weekend in Belfast! The home was perfect in every way. Gorgeous views from everywhere! Very spacious, all rooms were great! Loved the outdoors as well. Enjoyed the kayak on the Passagassakeag! The fire pit was fabulous...and thanks for all the wood and fire starters! We could have stayed for much longer! Cooked fresh seafood in the perfectly appointed kitchen. We weren't missing anything! We like to try different places all the time, but we would all agree that we would love to come back here! Thanks! We rented for two weeks in July. The house is more than lovely, and the views serene. The main floor is spacious and open, and every bedroom has water views. The beds were comfortable, and all amenities provided. We happened to hit the some unseasonably warm weather and the bedrooms were a bit warm during the day, so we had to nap the little ones in the one room that had a window AC unit, which was a minor inconvenience. There were many fans in the house, which helped cool the bedrooms enough in the evenings, and based on our feedback, I believe we were the last guests to stay in the house prior to the owners putting heat pump air conditioner units in every room shortly after our trip. The owners and property manager were available and responsive to all our needs. On our first day we noticed that some bees has take up residence under the main deck, and two of the people in our group were allergic. After one call to the owner , the property manager and an exterminator were there the next day to take care of it. The location of the house is on a quite street with plenty of parking, and is an easy walk via the footbridge into town. A little shout out to Wild Cow Creamery who just opened there Belfast location the week before we arrived, and who's incredibly inspired flavors of all natural ice cream had us crossing the bridge almost daily! Moose Point State Park is a short drive if you looking for a beautiful spot for picnicking/BBQing and had great playground for kiddos about 5 or under. Belfast City Park has a playground that was better for kids 6+, and a free community pool. Young's Lobster Shore Pound is amazing for a water side, casual and fresh catch authentic experience. Nautilus Seafood was great for a higher end seafood dinner on the water in Belfast with great sunsets. If your going anywhere near Camden The Waterfront is a ME institution that has the best Lobster Roll and Clam Chowder and dock dinning around. If your looking for a beautiful round of coastal golf, and don't mind ponying up the dough, Samoset Resort is worth the drive and money! Lovely home, close enough to town for convenience, but out of the way. Home was spotless, and beautiful grounds kept up well. Stayed very cool over a hot weekend. Owner was very accommodating and friendly. A charming house on the coast of Maine in Belfast. Beautiful get away for either rest or activities. House was clean and well supplied. We are already looking forward to our next visit! Midcoast Maine è rinomata per la sua bellezza naturale. $2,900 - $3,500/week * RENTAL TERMS: - BOOKING: The rental agreement will be emailed to you. Once the agreement has been signed and returned with a deposit equal to 50% of the applicable weekly rental rate, the dates requested will be reserved. - REMAINDER OF ENTIRE RENTAL FEE is due 60 days prior to arrival. Security deposit will be returned within 21 days of departure.